A CERN magnet originally built for the UA1 detector and later used by the NOMAD experiment has just set sail for a new life in Japan. Spotlight on an incredible voyage by land and sea. See the video at the end of the article! Transporting a magnet weighing almost a thousand tonnes (the equivalent of the take-off weight of four Boeing 747s) from Switzerland all the way to Japan is not a matter to be taken lightly. Shipping agents are rarely called on to transport this type of "goods". Even for CERN, which is no novice in the transport of exceptional loads, having sent components all over the globe since the dismantling of LEP, this is one of the largest-scale long-distance shipments it has ever had to organise. 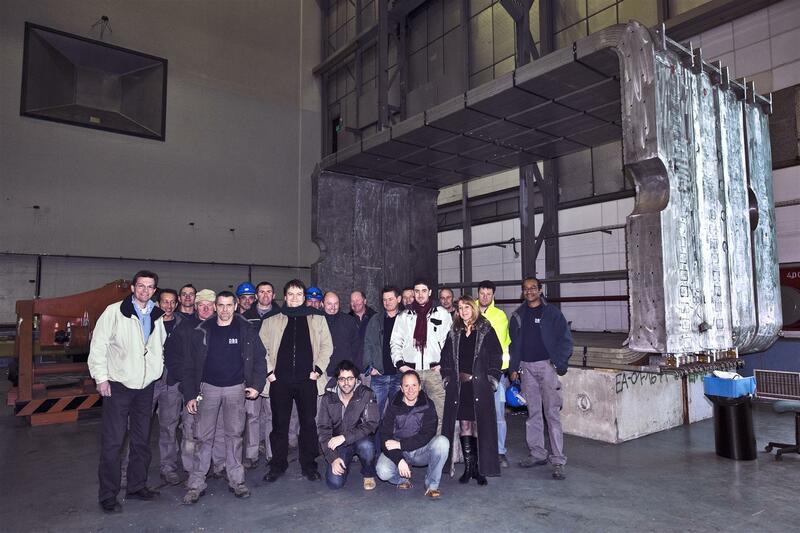 Pictured in front of the magnet coils is André Rubbia (centre), leader of the project, together with some of the members of the CERN logistics and transport teams who spent almost a year working on the project, including Patrick Muffat, a logistics expert from the FI/LS Department (bottom right). Thirty-five containers carrying 150 parts left the Meyrin site in the last two weeks of January. In 2005, at the request of European physicists involved in the international T2K neutrino experiment in Japan, CERN decided to donate the former UA1 magnet, its coils and other equipment, with a residual value of 6 million Swiss francs, to the Japanese High Energy Accelerator Research Organization KEK (see box). Originally built in 1979 for the experiment that earned Professor Carlo Rubbia his Nobel Prize, the magnet was later given a second lease of life with the NOMAD neutrino oscillation experiment. Since the closure of NOMAD it had been stored in the open air, exposed to the elements, on the Prévessin site. More than seven years passed before it was brought out of retirement for a new adventure - and not just any old adventure! All the parts were cleaned, polished, repainted and given a general overhaul ready for a new life in Japan. "The main problem was that some of the parts could not be transported in one piece, especially by sea. A lot of the equipment had to be dismantled before being loaded into containers. It was like a giant game of Meccano", says Patrick Muffat, the logistics expert from the FI/LS Department responsible for organising the shipment from CERN. "We had to find containers at European ports meeting our very specific measurement requirements and work out an itinerary compatible with the different transport and customs regulations of each country involved." The general overhaul and other work needed to prepare the parts for shipping took almost one year. "Without the invaluable technical and logistics assistance provided by CERN, it would have been very difficult to organise the transport operation", acknowledges André Rubbia, a professor at ETH Zurich, who was responsible for the magnet project. In the hall of Building 185 the 150 parts were packed, secured and placed in containers with the utmost care. One by one, since 14 January, 35 sea-going containers have begun their long journey to the Land of the Rising Sun, to a point 60 km north of Tokyo. 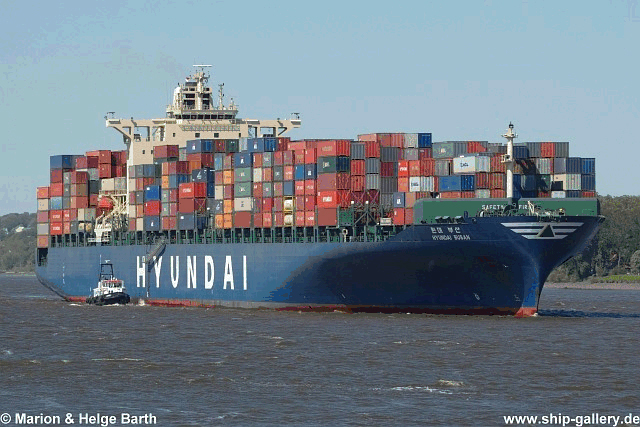 Having been transported by lorry to La Praille and loaded onto freight trains that took them to the port of Antwerp, the containers are now aboard container ships bound for Pusan in South Korea, from whence they will sail to the port of Hitachinaka, their point of entry to Japan. However, the largest magnet component, consisting of the four extremely fragile coils, has yet to leave CERN. Measuring 4.75 metres in height, this huge aluminium frame weighs close to 40 tonnes. It must be perfectly fastened and secured in order to withstand the numerous constraints of all the different means of transport. The coils, which will be packaged into two 1.70 metre wide consignments and transported as an exceptional load, will be shipped at the beginning of March. They will be transported by lorry to Basel and taken by barge to Rotterdam, from where they will set sail for Japan. Once the various components have safely arrived in Japan, the magnet will be re-assembled at the J-PARC facility in Tokai, 60 kilometres north of Tokyo, where it will be used in the international T2K (Tokai to Kamiokande) neutrino oscillation project. The project, which is a recognized CERN experiment, has 350 members, including 150 Europeans from France, Germany, Italy, Poland, Spain, Switzerland and the United Kingdom, and will start using the magnet in autumn 2009. In a similar manner to the CNGS-OPERA experiment, which involves the sending of a neutrino beam from CERN to Gran Sasso in Italy, the J-PARC accelerators at Tokai will send a 40 GeV proton beam to a target to produce an intense low-energy neutrino beam directed towards Super-Kamiokande, Japan’s neutrino observatory 300 km away. T2K’s goal is to produce the world’s most powerful neutrino beam, known as the superbeam. Physicists think that neutrino oscillation could depend on three mixing angles and a new term of CP violation. This new type of violation could have played an important role in the asymmetry between matter and antimatter we can observe in today’s Universe. To date, only the first two of the three mixing angles have been measured precisely. The T2K experiment will attempt to determine the third. "This is an extremely important step for neutrino physicists. Determining this angle would allow us to open up a new window on CP violation in neutrinos", says André Rubbia.